Are you struggling to make your life easier during your baby’s first three months? Well, you’re not alone! Most parents, or should we say, almost all parents experience this dilemma. It’s now clear to you that being a parent isn’t as easy as you’ve imagined a couple of months ago. Why? Here are some explanations. Welcome to the Fourth Trimester! “What? I have gone through the three die-hard trimesters and there is an extension?” Yes, and better be prepared for the battle! The first three months of a baby’s life is also referred to as the “fourth trimester” due to the very crucial role you’ll be playing as a mom. The good news here is that now, you already have someone you can share your everyday struggles with – your partner. 1. Your baby will be totally dependent on you. During the first three months, newborns are entirely dependent on their moms, which is closely similar to the way they used to rely on their mothers when they were still inside the womb. They need you to feed them, bathe them, change their diapers, cuddle them, and soothe them. 2. This transitional stage allows your newly born baby to adjust to the sudden shift in the environment. This is the time that your baby will be learning a lot of new things like feeding, sleeping, and coping with day time and night time. Hence, you’re not the only one struggling here, your baby is going through a lot as well! 3. During this stage, your baby will always cry A LOT! Babies do this to signal their parents that there is something wrong or that they need something, and will not stop until those needs are met. This is a time for guessing games as you guess whether they’re hungry, has colic, feeling pained, or has a wet diaper. But don’t worry! You’ll definitely learn to distinguish what your baby needs as time goes by. 4. It will require you to do a lot of night shift work. As mentioned earlier, your baby has yet to develop his senses with regards to differentiating night and day. Your baby can be a daytime sleeper and become more active during the night. Also, take note that babies often urinate and poop in uncertain times of the day and this means changing diapers during the wee hours as well. Overall, you may need to adjust your body clock to do night time tasks like feeding and cleaning the baby. The fourth trimester might sound as complicated as pregnancy itself but as you become a more experienced parent, you’ll realize that there are certain ways to make your life a whole lot easier! 1. Hack It Off With Your Partner! You both love your baby so it wouldn’t be a big deal to share the responsibilities as well. Shift schedules with your partner! Okay, so you are the primary care provider and you might be doing every single stuff for your baby the whole day. This is acceptable since your partner might find it nerve wracking to earn more money for your family’s growing financial needs. However, you can always arrange with him regarding taking shifts in caring for your baby and get some hours off to rest and regain your strength for the next day. Whether it’s a simple change of baby’s nappy at midnight or taking care of the baby while you do your bathroom stuff, you’re sure to feel relieved of the hard work when you and your partner work together as a tag team. Place a clean diaper under the soiled diaper prior to changing it. A speedy diaper change will result to lesser chances of “pee and poop accidents”. Always have a few pieces of diaper and baby wipes within reach. You can have it in the nearby bedside table or simply place it on the corner of the bed. This will come in handy later on and will minimize your baby’s crying episode. Always have enough supply of diapers in your home – just ENOUGH! It can be a 1-week or 2-week supply of diapers, but not more than that. You would want some on-hand stock of diapers since your baby will be using a lot of it during the first three months. However, overly doing it wouldn’t help you that much. Your baby will be growing at a very fast rate and this means a drastic change in diaper size as well. Make use of baby changing pads. These are your handy tools in minimizing “bed leaks” during a diaper change. They are waterproof and easy to clean. Always have a baby comforter ready for the baby. Preparing an extra comforter is most helpful when dealing with your baby’s pee and poop accidents. You can easily remove the baby comforter and replace it with a new one. It is easier to wash as compared to washing the whole set of bedding. A baby comforter also allows you to easily move the baby across the bed without disturbing his sleep. It saves you more time when preparing for feeding. It saves you from a lot of crying episodes. It saves your baby from indigestion and colic. Use a little amount of hot water in mixing milk formula. It is easier to mix and kills potential germs. Use distilled water to fill up the bottle. It works the same as the cooled boiled water and will save you time and effort! Invest in a bottle sterilizer. If you want to save more, boiling the bottles in a pot works the same as the sterilizer. Place the bottles, the water and the milk formula in the bedside for easy access. Make sure the bedside is well-lit for milk preparation and feeding (a lampshade or mini light will do). Invest in portable milk powder containers. They will help you minimize spills during nighttime milk preparations and you can also use them when travelling with the baby. Though it is tempting to just place the baby on the bed after he has fallen asleep after feeding, it shouldn’t be the case! Burping the baby will do you more good than harm. When the air in the stomach is released through a burp, episodes of colic and milk reflux is greatly minimized. Here are some effective ways to easily burp the baby! Place the baby on your chest on a prone position. You can either be lying down or leaning on a chair. Carry the baby towards your chest with his head slightly above your shoulder. Make sure to provide enough support on the neck and head part. Place the baby on a prone position over an extra firm pillow. Do not use a soft pillow to minimize the risk of suffocation! Also make sure you support the baby’s head with the palm of your hand. Together with the above-mentioned positions, gently rub or tap the baby’s back to allow air to come out. Do this very gently and avoid the spine area. To change your newborn’s clothes faster, remove the other side first, then dress up that side. Wrap the baby with the new clothes while you simultaneously unwrap him with the old one. Finally, you can dress up the other side fast and easy! When changing soiled body suits, removing them downwards would save your baby’s face from getting in contact with the dirty portions of the clothes. Open the tiny buttons on the shoulder part of the body suit to snuggly take it off. This idea is when you buy baby clothes for your little one. Apart from the fact that they get bigger every week, you’ll benefit from clothes that are a bit loose and snug since you can use them faster in dressing the baby. Another thing is that tight fitting clothes seem to be uncomfortable for the baby and they can also compress the diaper which will cause the urine to leak. Investing in some premium quality clothing that Starlight Baby offers.Rather than going for the cheapest and having to replace them constantly (or having them fall apart or break at the most inconvenient of times,) consider Not only will it significantly outlast the time your baby will spend wearing it, you can even save it for future children or give it away to a friend or family member! Being a hands-on parent can be both satisfying and exhausting. Most of your day will be occupied by baby-caring stuff, and sometimes, even your rest hours need to be sacrificed. But don’t despair! Here are some handy items which can assist you to take care of your baby in the coolest way possible. A baby cradle or hammock can be among your best companions when trying to soothe a crying baby. You can place your baby in it, leaving your hands free to do some other tasks. The gentle rocking motion also seems to make them feel sleepy and appeased. When your baby has fallen asleep, the hardest part would be laying him down the bed in a way that will not wake him/her up. This is where magic bolster pillows come in! You can place them on each side of your sleeping baby to make him feel that he is cuddled in your arms. This will make your baby sleep longer and offer you some free time to rest, too. When you are worried about slip accidents while bathing your baby, anti-slip bath mats can be your best friend. It can keep your wet and soapy baby in place while you clean him up. Your baby has just started adjusting to the temperature in the new environment and guessing whether he is feeling hot or cold is quite hard. Make sure you have your own thermometer at home to check your baby’s temperature. It is important to note that you need to seek medical attention promptly if the temperature is too high or too low. Parenting might be too overwhelming for the first time, but you’ll be surprised that in a few months, you’ll transform into an expert. 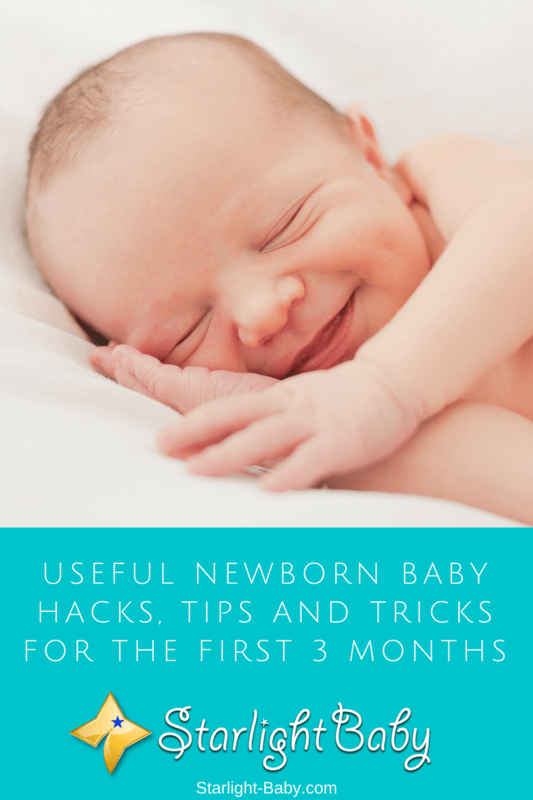 These baby hacks will help you a lot and in the long run, you’ll also have your own hacks to share based on your own experience. Why Do Babies Cry So Frequently In Their First 3 Months? This is a very good and detailed article on parenting, and it’s going to be very useful to those parents who are new to the job with their first baby knocking on the door step. As much as everything seems, the major part of the parenting job falls on the mother alone when the baby is within the age of 1-4 months but having a committed partner is definitely going to make it a little more easier. The tips provided in this article are going to be so helpful in getting a new parent know how to manage their new born baby and not feel frustrated because of the excessive demanding nature of the child as it’s not his fault for still being too tender. The breastfeeding hack, bottle feeding, clothing hack, cradle hack etc are all going to be helpful as long as the parent apply them to the latter. When it comes to the first few months, moms are indeed more hands-on as compared to dads. I would say this is so because dads are not sure how to handle the tiny baby. Typically, when the baby is bigger and able to support his head, that’s when dads usually get the courage to handle him/her. But there are dads who are hands-on from the very beginning. And this is a great support to the mom because it unburdens her of the weight of taking care of the baby alone. This is really a helpfull article specially for new mommies out there. I myself have a four month’s old baby. We named him John Matthew, his really adorable . On his first to third months I really struggled that time on him. My baby is always hungry at night, he always eat eat and eat everynight. Im a full time breastfeeding mom so im really exhausted that time but now his pattern of sleep change. His awake at morning and sleep at night thats why more sleep for me. This article about newborn baby really benefits our moms out there they will be aware on what to do on their babies. It’s a good thing you’re breastfeeding full time. That’s really beneficial for your baby. For me, I had to alternate breastmilk with formula because I needed to go back to work after 60 days. Sometimes, my milk is also not sufficient so I supplement it with formula. Seeing your relative become a mom was a fun experience. There was this glow to her skin and she was happy to have her baby by her side. But she knew the battle would be tough. She had to stay up at night just to make sure the baby was sleeping. These tips are truly helpful. Some of them she learned from experience but others she found made a huge difference especially, the hack for diaper change. Having a newborn is indeed pure happiness. It’s not all glory but when you see your baby smiling at you or if you hear him/her laughing his/heart out, it’s pure bliss. There’s something about a baby’s laugh that could melt any heart. So it’s understandable if it brings a glow on some moms. A baby indeed brings a different kind of glow in a family, especially if it’s the first baby. Most family members look forward to their first niece/nephew, grandchild. I’m looking forward to my first grandchild too, but I hope not so soon. I just miss having a baby in the house now that my kids are grown up. An informative if not slightly overwhelming read. Not overwhelming in terms of the writing style or tips of course, just in thinking about everything going on in the first few months and how much is needed to get by. I can’t imagine trying to raise a newborn baby without a committed partner! Oh yes, ecole11j, raising a baby is such an overwhelming task, especially if you do not have someone to share the tasks with. It’s truly important that we get support from our partners, family and friends. Without them, I’m sure life would be a real mess for us, haha. We don’t really use diapers. The decision is mutual with my wife. It is because of health reasons for our baby. So we used, and are still using muslin cloth for our baby. So changing is really double effort for us because every time that our baby urinates, we have to change it. Good thing that we both have no work because we have our own business. And our business is the kind that gives us a lot of freedom with our time because it’s more of a passive income type of business. So i could say that we really are a tag team when it comes to taking care of our baby. Not to shame those who use disposable diapers, but I have a great deal of respect for those who choose cloth diapering. I know it has its challenges, but it’s so much better for the environment. That sounds really awesome for both of you to be able to take care of your baby full time. Wow! It’s interesting to read about the sleeping time of babies for many parents never knew that their kids might want to sleeping in the day and if they never recognized, it might result in issues. Knowing the feeding hack is also good for many always neglect the importance of breastfeeding their babies and that might make the baby not have the needed nutrients while growing. It’s great to read these hacks and wish to let my fiance know them as well. Babies do have different sleeping patterns in their first few weeks. The pattern becomes more regular in time – they already sleep at night and only takes naps during the day. And yes, breastmilk is always best for babies. No other milk could measure up to it. I agree with you on the fact that the sleeping schedule becomes regular as they grow older. I was at the place of my friend to see his wife that delivered a baby and the baby was crying when I got there. So, I told the mom to pet her to sleep and before a minute, we saw the baby sleeping which amazed her. I told the mom to always watch to see the time the baby sleeps to avoid cases of having her cry when she wants to sleep. The baby is six months. We have survived the fourth trimester. I did not know the fourth trimester was used for the first three months of the baby. There were experienced parents by our side, our parents, and siblings. Their tips and tricks helped us a lot. You’re lucky to have experienced parents and siblings to assist you with your baby. Thank God for family 🙂 They are really the people we can turn to for expert advice. When it comes to take tips on parenting, I trust my sister more than the “so called parenting experts.” My sister’s parenting tips are based on her own experience, where as these experts base their opinion on books. Well I don’t mean any offense, however, the experts too much theorize parenting. Parenting is learned by becoming a parent, and not from books. Thank you for this informative post. The clothing hacks and feeding hacks are very helpful. My mom used to invest on clothing diapers for my sister since the other diapers were made of materials that irritated my sister’s skin. Yes, cloth diapers help avoid rashes in babies. It may be inconvenient to use because of the need to change them frequently, however, the comfort that it brings to babies outweighs the inconvenience. Given what I now know about babies and kids, I can’t believe I made so many first time mom mistakes. So this article will correct the mothers strategies to have a much better and easy mother duties. The first 3 months of a baby can be a really pretty intense that’s is why the mother who already read this article is lucky to know this ultimate mom survival guide. Don’t worry about your mistakes, you are not alone. I know this because I made mistakes, too. I’m sure many moms who do not have family members to guide them also made mistakes along the way. I would say even those who had help from family members still made mistakes. It’s a natural part of parenting 🙂 Eventually we learn to do things the right way. Moms these days are indeed lucky to have information like this on their fingertips because they could get guidance easily. I could just imagine those who didn’t have internet when they were raising kids. It must have been really difficult.